When stained glass windows start to lose their structural integrity, it’s important to have them professionally repaired and restored. But how are churches supposed to finance such an endeavor? Stained glass restoration in San Antonio is a labor intensive process, and one that can be performed by only a handful of companies, and therefore can become expensive. But don’t worry, there are plenty of ways that you can obtain the necessary funds you need to restore the stained glass windows in your church. All it takes it a little bit of creativity and fundraising. Stained Glass Restoration – How Important Is It? Stained glass windows are by nature extremely durable. But they still need to be looked after and cared for in order to ensure that they last. Antique stained glass windows, especially, are prone to experiencing wear over time because some of the techniques that were once used for creating stained glass have now been found to be problematic. Though they are no longer employed today, some of the oldest stained glass windows contain design flaws that eventually lead to their deterioration. When stained glass repairs are neglected, the condition of the windows gradually declines. Many churches fail to notice eminent warning signs, which has caused some of the most extraordinary masterpieces to be lost forever. As soon as issues of deterioration are noticed, they should be addressed immediately. Churches should make a point to inspect their stained glass windows regularly and get repairs when necessary. Perhaps the most important thing required for stained glass repair is advocacy on behalf of the church. Someone must be willing to step up to the plate and educate the congregation on the cultural value and importance of the church’s stained glass. Once someone has spread the word about the need for repairs, the next step is fundraising. Preparing for a fundraising project does take some effort, but it’s not as complicated as it seems. There are many great ways that churches can raise funds for stained glass restoration in San Antonio. Your church may choose to create pamphlets or brochures to pass out to your members for educational purposes. Or, you can hold a fundraising event, such as a fun run or bake sale or start an online crowdfunding campaign. Another neat idea is to create metal plaques to place underneath the repaired stained glass for the purpose of honorable mention that give special thanks to the donors. Some churches may even qualify for special grants to assist with their project. You just have to be willing to do some research! 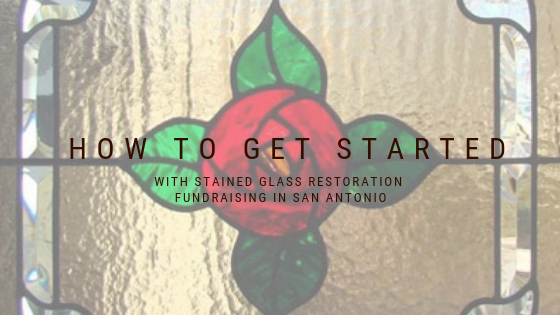 If you would like more information on fundraising or stained glass restoration, our San Antonio team would be happy to help. Contact our office today to speak to a member of our team.